Hanoians usually eat bun oc for breakfast or lunch, particularly in winter. 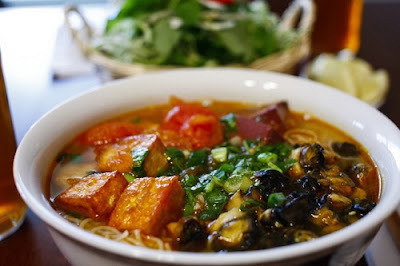 When it gets cold, it is hard to imagine anything more delightful than slurping down a bowl of steaming hot and spicy soup with the chewy but tasty snail in it. The best snails for this dish are oc buou and oc nhoi, two large, rather rounded snails with streaks of color. After boiling the mollusks, the cook pulls the meat out of the shell and fries it with onions, fish sauce, and MSG. The broth is made from the water used to boil the snail and cooked with tomatoes to make it sour and pig bones to make it sweet. Tofu, vinegar, cooking oil, pepper, salt, sugar, and dried chili are then added to the consommé. The snails are placed in a bowl of rice vermicelli and the broth is poured over them. Bun oc is accompanied by a variety of fresh vegetables and herbs like lettuce, coriander, perilla, knotweed, and basil. 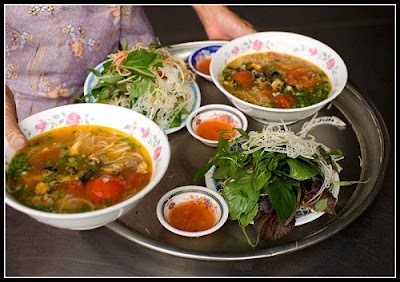 It is said in Hanoi that women frequent bun oc stalls more than men. It could be because the dish is not fatty and can be eaten as a snack between meals. For Hanoians, the dish is the most sought-after food during the Tet (Lunar New Year) holidays when they are usually glutted with meat. While a bowl of hot snail noodle soup is perfect for winter, bun oc nguoi (nguoi means cold) is the dish of choice in summer. When customers order for cold bun oc, the vendor will give them a plate of rice vermicelli, a bowl of boiled snails, and a small bowl of dipping sauce. The snails are served with vermicelli dipped in the dipping sauce which is a mixture of fish sauce, vinegar, ginger, and chili. Bun oc can be found in small shops along streets and alleys or on a pavement where a vendor has been plying his or her trade for years. It is not clear why snail noodle soup is much more delicious at street stalls than at home, but street vendors keep their recipes secret. In Hanoi the most famous streets for bun oc are Mai Hac De, Hoe Nhai, Hang Chieu, and Hang Khoai and the area near West Lake (Ho Tay).